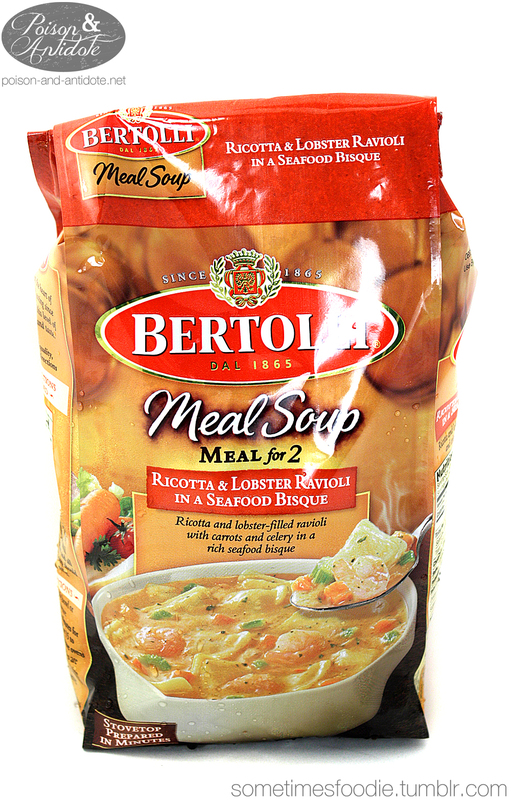 I have had frozen Bertolli dinners before, but never a soup. When I saw this at Target I got really excited. My boyfriend loves seafood and I usually share everything I review with him, so I thought this would be something yummy and fun to do together. The packaging is pretty busy for an American product. (Especially one aimed at adults.) I think that the company was going for a warm Italian kitchen feeling, but it’s just too much. There are too many different colors topped with bold red banners. I think they need to step back and tone it down a little. That would make it appear a little more high end and sophisticated. When it came to making it, this was super easy to prepare. All you have to do is pour the contents of the bag into a medium sized pot with one cup of milk. Top it off with a lid, heat it up, and you’re good to go. I was impressed by this soup the second I opened the bag. 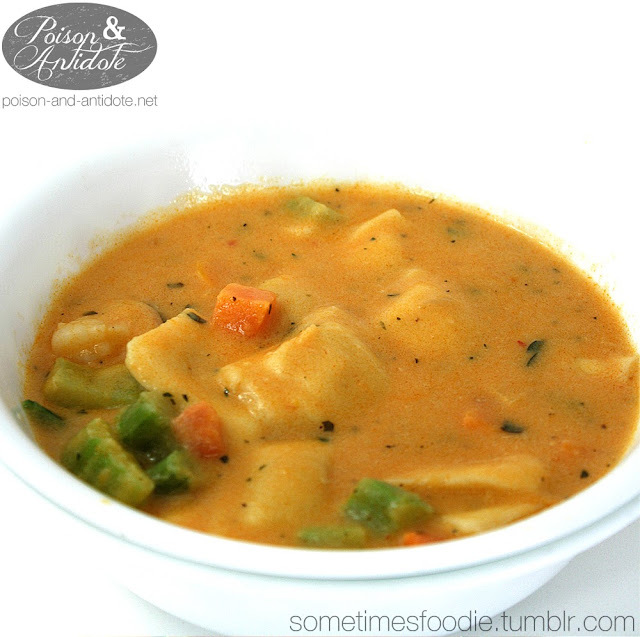 I could immediately see a lot of shrimp, ravioli and veggies mixed in with the little cubes of frozen broth. Speaking of broth, whenever I purchase pre-made soups they usually contain more broth than anything else. (I’m looking at you Campbell’s.) When compared to other store bought soups, this soup is very well balanced. How does it taste? Delicious. This soup is leaps and bounds better than anything you can buy in a can. First of all this wasn’t heavily salted like a lot of the prepackaged soups, but it was well seasoned. Everything tasted fresh, the broth was deliciously creamy, and there were lots of seafood flavoring. Although the package is a little pricey, I really enjoyed this soup. 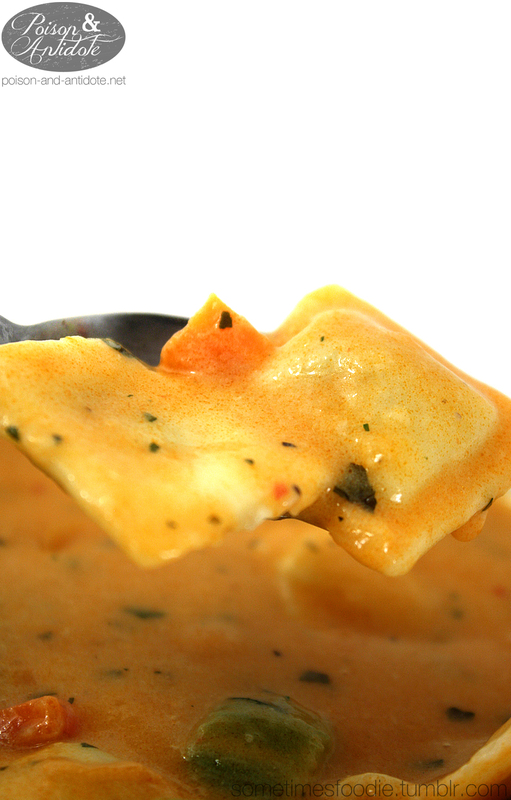 I imagine that making your own from scratch would taste even better, but this is a fantastic alternative to canned soups and a great easy dinner for two.